The following links and Powerpoint presentations describe CPNWH, its activities, digitization efforts, and progress made to date. 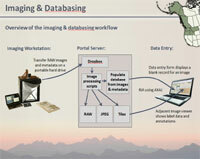 A set of documents describing the imaging technology and workflows used by the Consortium for imaging specimens at regional herbaria. Included are the scripts used during the workflow and complete instructions for assembling the customized equipment and accessory components we have developed. 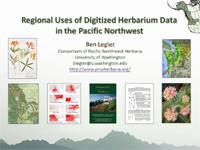 Discusses the ways in which the PNW Herbaria web site is used by individuals both within and outside of the herbarium community. 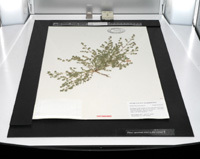 Also includes an overview of our 2010-2013 NSF grant for digitization, descriptions of resources available through the PNW Herbaria web site, and software and workflows we've developed. 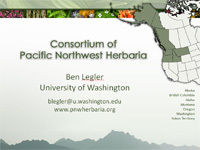 Provides an overview of the Consortium of PNW Herbaria, including how we started, progress made to date, our current work, and the hardware, software, and workflows we have developed. This presentation provides details on our current 2010-2013 collaborative NSF grant. Under this grant, we are partnering with numerous herbaria in the region to image and database their collections. The technology and methods we are using are described in general terms here. 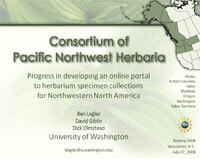 The following presentation provides an overview of the PNW Herbaria portal in its early stages of development, including technical aspects of the initial portal design and future directions.